"Woody's Diopter", the rage of uw-photo. Also known as a "Nexus Wet Lens". Buy a dozen! The Nexus push-on closeup diopters give an additional 20% image size increase when placed over the port front. While underwater the diopter lens is easily pushed on over the port front or removed to allow return to the lens alone. #NCL-100 fits the Nexus 60mm Macro Ports, Ikelite Macro Ports, and RS 50mm lens. The Nexus diopters also come with a lanyard. 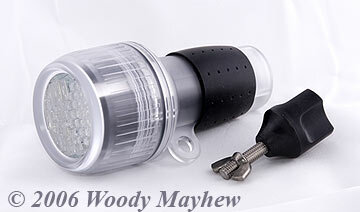 This 44 LED dive light is an excellent focus light since it throws a wide, even, and white beam of light. It is not so bright that it scares creatures but bright enough to use even for manual focus. It has a tab with a hole and a mounting bolt and wing nut for mounting directly to a Nexus Port Ring's vertical stay. It can also be attached to an Ultra Light Sea and Sea strobe adapter and used with an Ultra Light triple clamp if not used with a Nexus Port Ring. It also comes with a wrist lanyard. It takes five AA batteries, rechargable or alkaline, and has an On-Off switch. LED lights have very long battery life compared to incandescent bulbs so one set of batteries can be used for multiple night dives. It also has an emergency flasher function which provides an extra measure of safety for the diver/photographer.. These chargers are the best we have found. 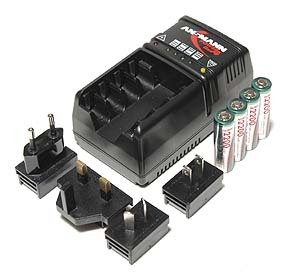 We recommend them to anyone who regularly travels between locations with 120V and 240V current and 60 and 50 cycles. Just plug them in anywhere with voltage between 90 and 260 Volts and cycle frequency between 47 and 63 Hz and they will automatically detect the voltage and correctly charge the cells. The Powerline 4 Traveler will charge the new Ansmann 2600 mAh NiMh AA cells in around five hours. In addition the Powerline 4 also has a discharge button for NiCd cells which will prevent the "memory" effect by discharging the NiCd cells down to the proper point before automatically beginning the charge cycle. Each cell charges independently in its own bay and each bay has a charging progress LED. The LED will also indicate a faulty cell at the beginning of the charge cycle. When a cell has reached its charge capacity the cell's charging bay switches to a trickle charge. The Powerline 4 charger has a set of snap-in plugs to fit the world's outlets. If you need more Rechargable AA cells to go with the Powerline 4 chargers see the next item below - Ansmann AA Nickel Metal Hydride 2600 mAh rechargable cells. 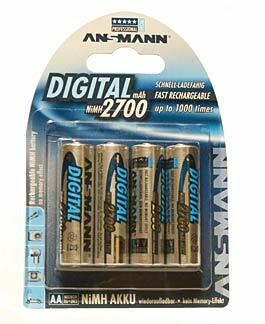 Ansmann AA 2700 mAh NiMh rechargable cells offer superior performance in strobes, dive lights, and digital cameras. They can be recharged hundreds of times. They contain no environmentally harmful cadmium. They can be fully recharged with the Powerline chargers (see item above) in about five hours. Nexus America also stocks Ansmann 3500 mAh NiMh C cells and 8000 mAh NiMh D cells. 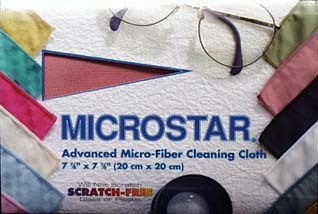 cleaning lenses, ports, even eyeglasses. Will not scratch. The Nexus Port Ring is available in sizes to fit the different Nexus Macro and Multi Ports and they are priced from $136.00 to $177.00, depending upon the diameter needed. The Port Ring can be rotated to place the light or other devices in any desired position arounf the port. The Focus Light Holders mount to the Port Ring Vertical Stay. The Fantasea 44 LED light at the top of the page mounts directly to the Port Ring Vertical Stays without needing a holder. The Nexus Light holder for the Sea Light or Toshiba K-243 4xAA Light is shown on the port ring in photo above. Nexus America stocks Ultra Light Port Ring Adapters for the Nexus Port Rings to allow using an Ultra Light Focus Light Holder which will work with most of the small and medium dive lights available. The Port Ring comes with an extra, removable, Vertical Stay for attaching another light or accessory. Specifications: The Multi Port allows changing from Auto Focus to Manual focus underwater and can be configured to work with five different lenses. This new port system will work with five lenses using the same Multi Port Extension body, either the ME-4 for the F4 Pro/D2x housing or the ME-5 for the Master/D-100, D70, D70S housing. 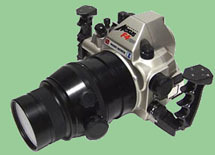 Different front ports and extensions and lens gear sets are available to use with the Multi Port body for each lens. The photo shows a Nexus F4 Pro housing configured for the 200mm AF Micro Nikkor or the 70~180 AF Micro Nikkor Zoom lens (the external parts are the same, only the gear set for each lens is different). The lenses usable with the Nexus Multi Port System are the 60mm AF Micro Nikkor, 105mm AF Micro Nikkor, 200mm AF Micro Nikkor, 70~180 AF Micro Nikkor Zoom, and the Sigma 180 AF Macro.